Cassidy, the sassy, lovable heroine, is haunted by the guilt of accidentally setting the fire that killed her parents and destroyed her home. Jared, the handsome cowboy hero, tries to help her come to terms with her tragic past. He gives her a precious silver medallion of Aquarius, the Water Bearer, that had once belonged to his mother. Jared rescues and protects Cassidy - he's a wonderful hero! He loves her and is wise in his love. 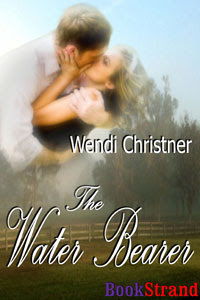 Writing in a flowing, descriptive style, Wendi Christner perfectly captures the country and the people of rural north Florida. She shows the country life in all its dusty glory. I could smell the cows and horses and men. I was fascinated by the Native medicine and spirit beliefs, by the country customs and by the kinship with animals, especially horses. Wendi also beautifully evokes the power of first love - its gradual awakening and awareness, its heat and passion and sweetness. There's tension throughout the story - will Cassidy leave or stay? Will she come to terms with the past? Will she and Jared find the love and courage to win through together? Read it and find out! This is a marvellous, heartfelt novel that I really loved. I have no hesitation whatsoever in recommending to everyone who enjoys compelling, realistic, glorious love stories. Thank you so much for such a glowing review. I'm thrilled you liked the story. The Water Bearer is very special to me. Jared and Cassidy are inspired by my grandparents, and their home is very similar to the small community I grew up in.